The Ivy House Bed & Breakfast is situated in Cirencester, a thriving market town in the Cotswolds, with a bustling market place presenting a colourful and lively scene. Shopping in Cirencester with its wonderful variety of quality shops is a delight. Enjoy exploring the courtyards with their individual style, and the many historic streets radiating from the town centre. Cirencester is renowned for its very special range of traditional and specialty shops, individual boutiques, fascinating antique emporiums, craft shops as well as national chain stores. Discover The Woolmarket, situated off Dyer Street, for those more unusual items not so commonplace in the rest of the town centre. Bishops Walk off Cricklade Street offers a new dimension to Cirencester, with High Street names intermingled with local shops and cafes. If you enjoy peaceful and pleasant surroundings as you shop, make a point of visiting Swan Yard, one of Cirencester's many hidden corners. Cirencester's Street Market, one of the oldest in the country, and a colourful feature of the towns life, is held in the Market Place on Friday each week. Local craftsmanship is well represented in Cirencester with craft markets on Saturdays. It is also regular host, on Fridays, to an antiques market. Brewery Arts is an arts and crafts centre, located in the heart of Cirencester. This nationally recognised craft centre is housed in a sympathetically converted Victorian Brewery incorporating individually run craft workshops, a coffee house, the Main Gallery and craft shop. The world famous Corinium Museum is just a short walk from The Ivy House and there's plenty of new exhibits to fascinate you. 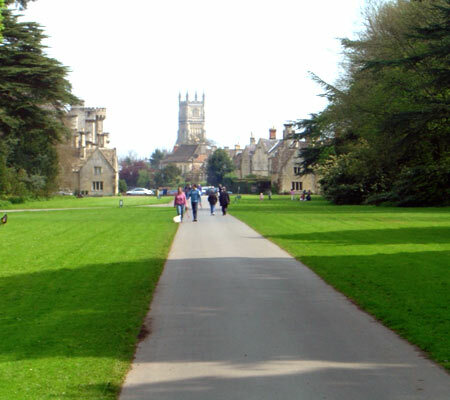 For more information on Cirencester, visit the Cirencester web site. © Copyright 2008 - 2017 The Ivy House, Cirencester and Commatic Limited. All rights reserved. If you encounter any problems or technical issues using this website, please contact the web designers, Commatic Limited of Cirencester.